Kington Castle stood upon a hill at the north west end of the present day town of Kington. 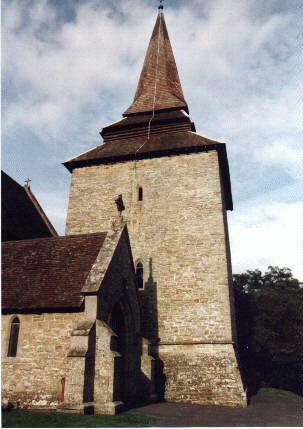 On the rise to the south of the fortress stands Kington Church, still dominating the town as the castle once did. The castle platform stands on top of a great crag some 20 metres above the Back Brook which flows down the valley from Wales. 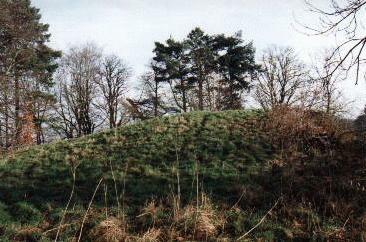 At the west end of the gently sloping platform is a large mound of earth which has been described as a collapsed motte, but is more likely the turfed over remnants of the castle tower or keep. Its dimensions were roughly 7 metres square and as these are approximately the dimensions of the present church tower it seems likely that the ruins of the keep, after having been destroyed by King John in 1216, were carted across the little valley between the castle and church, and used to re construct this tower. The castle bailey seems never to have progressed beyond the palisade stage, which is not surprising considering the precipitous drop that surrounded the castle on all sides. Kington Castle has a short, but not ignoble history. In 1093, around 17 April, Bernard Neufmarché defeated the Welsh King of Deheubarth (South Wales) in a battle north of the castle he was building at Brecon. This action proved the commencement of a seven year war between the Normans with their English armies and the remaining Kings of Wales. By 1099 the war had come to a close and the bulk of South Wales had been overrun by the Normans. It was probably during this period that King William Rufus of England granted to Adam Port, a younger sibling of the Ports of Hampshire, the royal estates in and around Kington in what was then known as 'Herefordshire in Wales'. This grant was made on condition that Adam would serve his king when needs be with a force of 5 knights and their retainers. The Honour of Kington, as it was later known, was thus formed as a five knights' fee barony. It is to be presumed that Adam built the first castle at Kington, which previously, as the name suggests, had been the King's Town. Adam was an important official of King Henry I (1100-35) and became his sheriff of Hereford. Adam was succeeded as lord of Kington late in the reign of Henry I by his son Roger who seems to have been a somewhat lacklustre supporter of the Empress Matilda in the civil war of King Stephen's reign (1135-54). Roger seems to have played no part in the fighting that gripped Herefordshire in the years 1138-41, although, under the aegis of the Angevin Earl of Hereford, he does seem to have expanded his lordship of Kington northwards, annexing the castle and district of Presteigne by 1146. Roger in turn was succeeded by his son, another Adam Port. Adam was prominent in royal affairs in Herefordshire during the early years of King Henry II (1154-89), but in 1172 fell out so badly with the king that he was forced to flee England to Scotland, leaving his wife under the protection of the monks of Wigmore Abbey. His castle of Kington was forfeited to the Crown. In 1173 Adam Port returned to England with the army of the King of Scots and together with Roger Bigod they devastated the Marches of Scotland from Carlisle to Newcastle on Tyne, destroying towns and castles and attempting to topple King Henry from his throne in favour of his son, the Young King Henry. The war against Henry ended for Adam Port and Scotland in 1174 when King William the Lion of Scotland was surprised and captured at the siege of Alnwick Castle, Northumberland. Adam Port and Roger Bigod fled the scene in disgrace according to a contemporary chronicle. Adam later made his peace with King Henry II, but he was never allowed his castle back. Instead this remained in royal hands. In the 1180's Prince Rhys ap Gruffydd of Deheubarth was putting extreme pressure on the defences of Herefordshire and as a result the Sheriff of Hereford was allowed 10 shillings to repair the palisade of Kington Castle. Five years earlier New Radnor Castle, just 4 miles west of Kington, had fallen to Prince Einion o'r Porth of Elfael. Kington Castle, however, seems to have weathered the storm. In 1195 Kington was probably one of the royal castles used as a base for the general assault on the territories of the Lord Rhys which saw the recapture of the Radnorshire castles of New Radnor, Cymaron, Bleddfa, Colwyn and Painscastle. In reply to this attack, the next year the Lord Rhys returned with a great army. He was met by Roger Mortimer of Wigmore and Hugh Say of Richard's Castle at the battle of Radnor. As a result of the encounter 40 Marcher knights and an innumerable number of foot were slain and soon afterwards the bellicose Hugh Say died, probably from his wounds sustained in the battle. It may have been to nearby Kington Castle that some of the defeated Anglo Normans fled the battle in disarray. In 1201 King John "Softsword" (1199-1216) granted Kington Castle and Barony to his favourite Marcher Baron, William Braose of Radnor, Abergavenny and Brecon (d.1210) for the service of just ½ a knight! William in any case had been holding Kington Castle for many years in his capacity as Sheriff of Hereford. Early in 1208 King John demanded the castle back from William in a dispute over money and loyalty. The now aging Marcher baron complied, but soon afterwards with his 4 sons in attendance attacked the castle in a futile bid to retake it. With this action of defiance the Braose Clan were forced to flee to Ireland, and many met a terrible fate at the hands of King John. In 1213 King John granted Kington Castle to his close supporter, Roger Clifford, and in May or June of 1215 the castle probably fell to the two remaining Braose brothers, sons of the great William Braose who had died in exile at Paris in 1210. In late July 1216 King John appeared at Hereford with an army and then marched on Hay on Wye. Here he called the last remaining Braose brother, Reginald, to him and offered him beneficial terms of peace. Reginald ignored the plea and John in vengeance burned the Braose town and castle of Hay on Wye. He then marched north through the Principality of Elfael to Kington and destroyed the castle and town on 4 August before continuing on his destructive path through the Braose Marcher territories. So ended the history of Kington Castle. The town eventually recovered on a new site down in the valley away from the castle and church, but no further fortifications were made at Kington. Instead, Reginald Braose, when he regained the favour of John's son, King Henry III (1216-72) in 1217 began a new fortress at Huntington to replace the now utterly destroyed Kington Castle.